Okay. I know it’s not the third Thursday of the month. But I missed last week. As I said yesterday, I went off the grid and went to the beach. 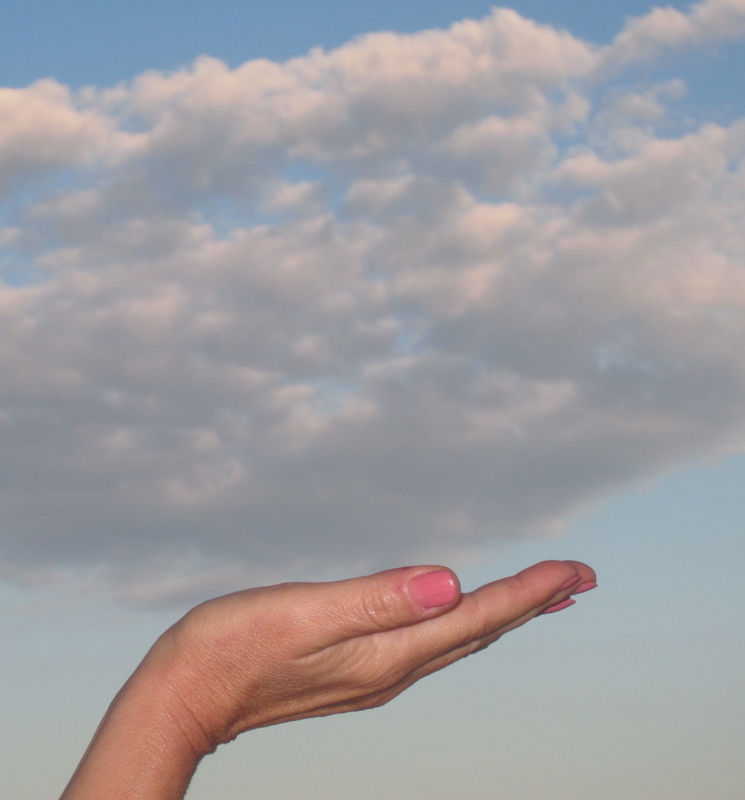 And while everyone else seemed to be catching a cold, I was busy catching a cloud! It passed right by my balcony and landed in the palm of my hand. It was light as a feather, soft as goose down. And what’s even more amazing, is the fact that my husband was nearby with camera in hand ready to snap this photo. That… is why you should never be without your camera. I don’t know how many times I’ve said, “Oh, wow! I wish I had my camera.” This morning was one of those times. A new subdivision is being built around the corner from my house. It’s now to the point where the grass seed has been put down. I was driving past this morning and lo and behold, a gaggle of geese were stomping around gobbling up the free, grass seed. But that’s not why I wanted my camera. Quick! Somebody call the Geese Police, please! These geese obviously thought they were above the law, bad to the bone, fearless to the feathers, outright rule breakers. Or maybe… they just couldn’t read. Whatever the reason, I’m hoping to catch these outlaws on camera. And when I do, you’ll be the first to know. So, stay tuned. I’m putting my camera in my purse and I’m never going to be without it again. Now, here is my question to you. If you had a camera in your hand this minute and could take any photograph, what would it be? Is it on a metropolitan street, skyscrapers looming above with distorted window reflections closing in on you? Are you witnessing a phantasmagoric scene? (See my words from yesterday, Word Wednesday;) Riding a bike through an imaginative place? Rolling pierogies in a church basement? Or maybe it’s just a gaggle of geese eating someone else’s grass seed. Whatever it is… it’s your vision. All I ask… is that you take at least five minutes out of your busy day and use your imagination. Describe your photo in words. Oh and by the way, I didn’t really catch a cloud. It’s just one of those crazy, depth of field photographs, a dreamy, optical illusion. Don’t forget to check out my column from earlier this month! This entry was posted in Uncategorized and tagged humor, imagination, silly, writing exercise. Bookmark the permalink.